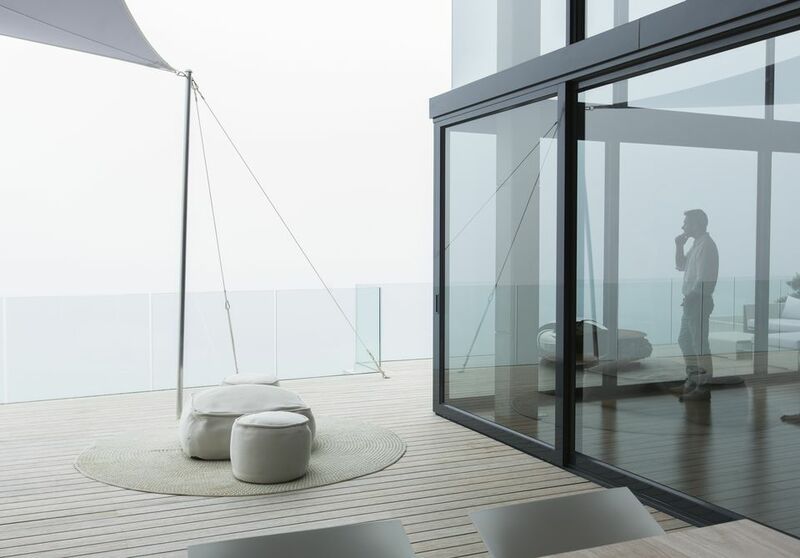 Sliding glass doors and windows are aesthetically pleasing because they allow extra light into the home, and they often open onto a deck or patio. However, the security risks with sliding glass are obvious. The larger glass panes are more vulnerable to breaking, and they present an easy point of entry to anyone willing to break them. Likewise, a sliding glass door can be lifted right off the track and removed if it isn’t properly installed and secured. The latches on most sliding glass entries are also not as effective as traditional deadbolts. Examine all the sliding glass in your home to decide how to best secure each one. Multiple methods exist to help you enjoy your sliding glass while reducing the risk of a break-in. A dowel rod is a round stick that fits into the track of a sliding glass door or window to prevent the glass pane from sliding across the track. If a thief disengages the latch on your sliding glass door, he still can’t get the door open with the dowel rod holding it shut on the other side. The key to using a dowel rod effectively is measuring the track to ensure the dowel rod is only a half inch shorter than the track. It also needs to be thin enough to fit in the track effectively. If you have a sliding glass window with a narrow track, a triangular rod works best because the edge of the wood fits into the track and the thin track holds it firmly in place. A security sensor notifies you when a sliding glass door is opened without your knowledge or permission. It sends a signal to an alarm panel when the glass opens, either triggering an alarm sound or automatically calling your alarm company, depending on your specific security system. When the alarm is turned off, the sliding panel can be opened and closed freely without the sensors activating. A shatter alarm is an additional sensor in a home security system that detects both the sound of breaking glass and the vibrations of the window when it gets struck. As a result, the alarm alerts you immediately if your sliding glass breaks. Most security systems charge extra for a shatter alarm, but it is a worthy investment. This is especially true if you have a lot of sliding glass or if you have a sliding door or window in an area of the home with low traffic, such as a basement. This helps alert you to a home breach that you otherwise wouldn’t discover on your own for some time. Inserting a metal screw or a washer into the top of the frame or into the track itself helps prevent the sliding door or window from being lifted out of the frame. The screw or washer acts as a stopper that prevents the glass from being elevated past that height. Make sure the glass still slides back and forth on the track smoothly before securing a washer or screw to ensure the sliding glass isn’t impeded. The lock on a typical sliding glass door consists of a latch shaped like a hook that grabs onto the door frame. These latches are typically unreliable and can be forced open with a hard shake or pull. This is another reason dowel rods are so useful. Another solution to this problem is to replace the basic latches with heavier-duty security locks specifically designed for sliding doors and windows. These locks are double-bolted and harder to tamper with than the usual sliding glass latches. Sliding glass often represents a larger security threat than traditional doors and windows, but it doesn’t have to. The proper tools and diligence help ensure that you enjoy all the benefits of sliding glass without the risks. Check your sliding glass every night before going to bed to ensure that all doors and windows are locked, the dowel rods are in place and that any sensors on the glass are active. Repair any damage to your sliding glass as soon as you discover it to keep your home’s perimeter in the best condition possible.